We may have found the newest perfect addition to our lunch gear! F&B absolutely love the idea behind the applesauce-type pouches, but I kind of dislike the cost and the fact that they generate so much trash per single use item. Plus, depending on the brand, the food itself may not be exactly what I would choose to buy. 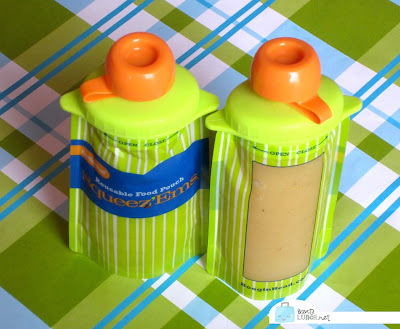 However, some foods (applesauce being one of them) just really need a good container and the kids really like the convenience of the squeeze pouches. And hey, messy kids? The squeeze pouches do cut down on the mess. Squeez'ems sent us a couple of their pouches to try and F&B are thrilled! We immediately had to pick up a jar of our favorite natural applesauce to try them out. We chilled them overnight and the kiddos took them to school the next day. The verdict? Perfect! No fuss, no muss, no mess, and they brought them home, I washed them, and refilled them again. Other things we loved about Squeez'ems? This week, we're going to try yogurt in them and if it goes well, we'll be investing in a couple more sets! We definitely would recommend them. They are! I just handwashed them though, with a bottle brush. These are so cool, my daughters have been loving the squeezable fruit/veggie things in their lunch boxes but these would make me feel so much better-I hate creating waste! Same here! I've only bought the disposable ones for trips but the kids love them. Happy kids and no guilt! I agree that I hate using those disposable ones! How do you clean the collapsible body part? Hot water and a baby bottle brush as soon as they get home. The opening is fairly wide when you unscrew it. They are also dishwasher safe, but I haven't tried it yet. Our dishwasher is kind of temperamental, so I'm not that brave yet!